Samsung will limit the batteries of South Korean Note 7 smartphones to 60% of their capacity following a recall of the devices. The firm asked for Note 7s to be returned following cases of phones that exploded during or after charging. An ad announcing the move appeared on the front page of the JoongAng Daily newspaper. The software update to limit batteries seems intended to provoke users who haven't yet returned their handsets. It will begin to be rolled out from 20 September, the ad says. The Associated Press reported that a similar advertisement also appeared on the front page of the Seoul Shinmun paper. It has not yet been confirmed whether or not a similar update will be pushed out to phones in other countries. The recall of faulty Galaxy Note 7 affects 2.5 million devices. In the UK, Samsung has offered to replace the handsets from 19 September and has asked customers to contact the retailers or mobile operators from whom they bought the phones. 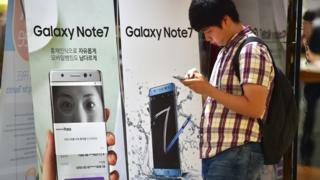 There have been more reports about exploding Note 7s causing problems in recent days. The New York Post reported that a six year-old boy in Brooklyn was burned after a Galaxy Note 7 exploded in his hands. He was taken to hospital but has since been discharged. Other reports have, however, suggested the case involved a different Samsung phone. And a Florida man claimed that the device exploded while charging in his Jeep, setting the vehicle on fire. Nathan Dornacher, who was interviewed by Fox News, said the car had been destroyed as a result. "Keeping the battery at 60% or less and an over-the-air update to resolve a hardware problem will not be acceptable to the majority of users, and Samsung's competitors can have a field day with this in device battery life comparisons," Chris Jones, an industry expert at Canalys told the BBC. "Most users will want to get rid of the device as soon as they can if they haven't already." "I would say it's not the best solution," added Will Stofega at market research firm IDC. "You don't want to limit the functionality at all." A spokesman for Samsung said that the firm had worked "intensively" to ensure that the quality of batteries was now assured. "Based on a thorough inspection, we are now confident that the battery issue has been completely resolved in the replacement devices that will be arriving in Europe shortly," he said.